As the Master Barista for Le Méridien Hotels & Resorts globally, I voraciously follow trends and coffee news to keep up to date about coffee consumption, emerging coffee destinations…and anything that I can add to the coffee programs that bring a distinct coffee culture to our 100 hotels across the globe. So to celebrate National Coffee Day on September 29 and International Coffee Day on October 1, I sought out the best ways to bring coffee culture to our properties, especially since lately there has been much buzz about the health effects of coffee. For example, two major studies recently found that coffee consumption can lead to a longer life, according to this CNN trend story. On the heels of these findings and to celebrate “everything coffee”, there are a few tips and tricks that as a Master Barista, I like to share with coffee aficionados and novices alike. Following are my favorite tips to give your coffee a kick and even help ramp up the health quotient. Cinnamon or Cardamom in the Cards? For a tasty and beneficial boost, I recommend two not-so-secret tricks. First, don’t be afraid to use a bit of cardamom, a spice that is commonly added to coffee in the Middle East. Cardamom has several healthy benefits, particularly as they relate to digestion. Research shows that adding cardamom to coffee helps to neutralize the stimulating effects of caffeine. And, a few dashes can reduce the acidity of coffee, making it easier to digest. So how can you reap these benefits at home? Sprinkle a bit of ground cardamom into your cup of hot coffee or toss in a few whole cardamom seeds to your beans before grinding. And as a second spicy tip, stirring a teaspoon of cinnamon into your hot (or iced!) cup of coffee for a great substitute for sugar and adds a bonus flavor boost. And you may even want to cold brew your coffee, which is also a lower-acid option. The ingredients for cold brew homemade coffee include: 60g of very coarse freshly ground coffee, 1L of water and 2 teaspoons of ground cinnamon or cardamom. 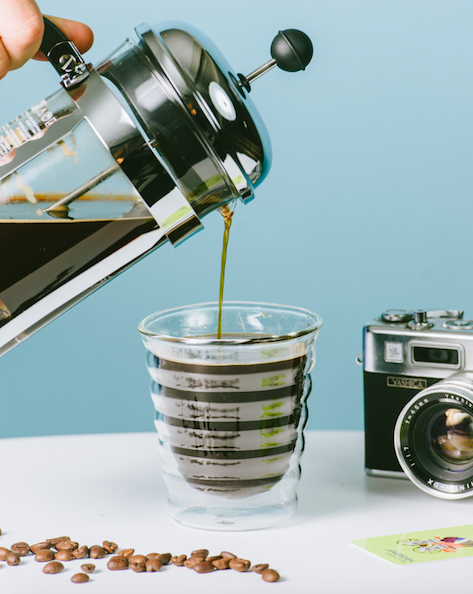 To prepare, add the ground coffee into your French Press, top it off with room temperature water and make sure to get all the grinds of the coffee wet. Cover it with the lid of the French Press and let it rest for at least 12 hours. Plunge the coffee grounds and strain your cold brew coffee in a glass over ice cubes. Sprinkle a tablespoon of grounded cinnamon or cardamom over your cold brew coffee, give it a good stir, add milk if you wish and enjoy. Learn the Lingo and Try Something New. Cortado, cappuccino, latte…oh my! With so many choices for espresso based coffee drinks, learning the lingo and a few coffee-based options will open up new possibilities for your morning and afternoon routine. And if you are sticking with your drip or cold brew coffee routine…get creative with your add-ins, maybe substituting regular milk for almond milk, coconut milk, soy milk or even hemp milk for a change of taste. Are you heading to the same coffee shop around the corner, ordering the same cup of coffee every morning? Or do you love to explore the ever-increasing number of artisanal third wave coffee shops and walk into a new establishment weekly? If you belong to the group of people that love to explore the newest coffee bars and are truly a cappuccino or latte enthusiast, you might have been asked by the barista how you drink your favorite beverage, “Wet or dry?” Confused? Well, knowing the answer to this question will truly change your experience! Get your cappuccino “dry” if you like it to be foamy with a thick layer of steamed milk on top of your cup. Or, opt for a “wet” cappuccino or latte, smooth and creamy in taste and with the skilled barista behind the bar drawing beautiful latte art into your cup to get your morning off to a great start. And when you think about variety, amp up your cappuccino game simple by using almond milk foam in combination with my homemade spice pear syrup and a perfectly freshly brewed espresso! To easily make homemade spice pear syrup, use 6 cardamom seeds, 1 cinnamon stick, 2 pears, 2 vanilla pods, 2 cups of sugar and 2 cups of water. Bring the water to boil in a cooking pot, and add sugar until it is fully dissolved. Let it simmer. Crush cardamom seeds, slice up fresh pear, add cinnamon stick and vanilla pods. Let the liquid rest for a couple of hours. Strain into glass bottle once cooled down and store refrigerated. Are you the type that sits down at your work desk, sips a hot coffee and just focuses on the tasks at hand? Thank your coffee, because sipping on java can contribute to productivity by helping you to focus. And, research from MIT and other sources shows that sitting down in a group environment over coffee helps to get the creative juices flowing as well – so grab your work team and let coffee stimulate conversation and ideas. Finally, coffee is the daily routine that gets most of us started in the morning, not just on National Coffee Day. Coffee is the daily elixir that brings us together to socialize at work and the satisfying treat that caps off dinner or dessert. Given the recent research, plus the quick and easy ways to enhance the healthy benefits and variety of delicious ways to drink your coffee, I encourage you to savor every sip.